Japan is a great place to travel with kids. The usual concerns that parents have about safety and food are simply not concerns in ultrasafe and spotless Japan. Instead, your biggest challenge will probably be keeping your kids entertained, as the very things that many adults come to Japan to see often bore kids silly. Use your imagination and balance your diet of temples with a few kid-friendly highlights. Visiting Japan with children requires minimal planning, unless your child suffers from allergies or has other dietary restrictions, or requires specific medicine that may not be available in Japan. The following is an overview of things to bring and preparations to make. Most supermarkets stock a good selection of baby food, but you may need to ask a clerk to help you read the contents. Organic baby food is hard to find outside Tokyo, so consider bringing a supply from home. Cots are available in most hotels (but not usually in ryokan) and can be booked in advance. High chairs are available in lots of restaurants (though in many restaurants everyone simply sits on the floor). Nappies (diapers) are readily available. A picture on the package usually indicates if they are for boys or girls, but you may have to ask a clerk to help you choose. The package also usually indicates (in numbers and ‘kgs’) the weight range of the nappies. Bottles, wipes and medications are also available at large pharmacies. There are nappy-changing facilities in some public places, eg department stores and some larger train stations. Breastfeeding is generally not done in public. Child seats in taxis are generally not available, but most car-rental agencies will provide one if you ask in advance. There are child-care agencies in larger cities, although outside Tokyo there are few agencies with English-speaking staff. Most cities are fairly accessible to those with strollers. Most train stations and many large buildings have elevators. However, many attractions such as temples and shrines do not have ramps. An issue, particularly in Kyoto, is the relative lack of pavements away from the main streets (luckily, the Japanese tend to be safe drivers!). Finally, you’ll find that the Japanese love kids and will fawn over the young ones, declaring them to be kawaii (cute). Unfortunately, this doesn’t always extend to people giving up seats on trains or buses to those with children in tow. That said, most trains and buses do have yūsen zaseki (priority seating for elderly, handicapped, pregnant women and those with young children). Let’s face it: even the most precocious kid will eventually get tired of temples, gardens and shrines. Here are a few hints to keep the little ones entertained in Japan. » Rent a bicycle, do some walking or climb a hill. After burning off those calories, even the most restless kid will appreciate a few moments quietly observing a rock garden. » Japanese kids on school excursions always make a beeline for the downtown shōtengai shopping streets – between the ¥100 shops and the game centres, there’s enough to keep them occupied for hours. » Kids, especially boys, love to watch the shinkansen (bullet trains) roll in and out of the stations. You can by a platform ticket for ¥100 to watch them for as long as you want. » Hollywood films are usually screened in English in Japan, so why not spend a few hours checking out the latest release. » Even if they can’t eat what they pull off the conveyor belt, most kids get a big kick out of Japan’s famous ‘sushi trains’. » Kids seem to have a natural ability to understand video games, whatever the language, so try arming them with some funds and letting them try the latest in Japanese virtual-reality game centres. » Japanese zoos can be depressing – animal pens are small and conditions are dire – but if you’re desperate to keep the young ones happy, it might be worth swallowing your ethical qualms for a while. 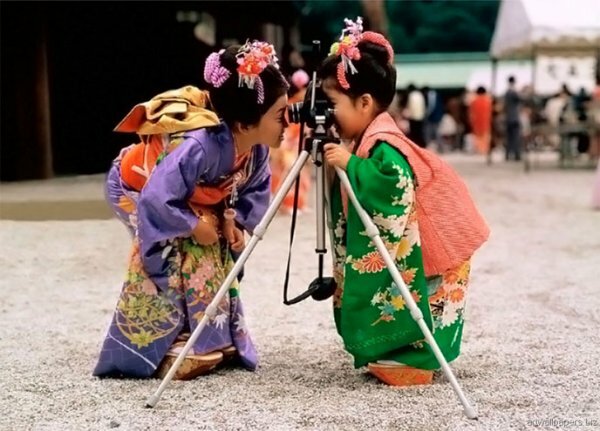 » Many companies in towns like Kyoto will dress your kids in samurai and geisha garb for a small fee, then photograph them in scenic spots around town.